The Egyptian-type column, narrowing towards the bottom, is in granite from Elba; originally it was associated with a capital and a base in white marble worked separately. The frieze is carved around the shaft immediately above a listel. Depicted are four pairs of priests or cult attendants facing each other and standing on high stools; their heads are shaved and wreathed with laurel leaves. All the figures wear Egyptian-style sandals; the canopic jar bearers are clad in long, high-necked tunics, while the other attendants have the upper part of their bodies uncovered. One pair depicts two priests both carrying canopic jars; the jar on the left is surmounted by the head of Isis, that on the right by the head of Osiris. In the second pair the priest on the left carries a necklace, the priest on the right a standard with the falcon god Horus. The priests standing on the left in the third pair hold a papyrus flower and a flute, while the priest on the right grasps a sceptre; the fourth pair depicts a priest carrying a canopic jar with the head of Anubis and a priest holding a statue of Harpocrates seated on a cubic throne. 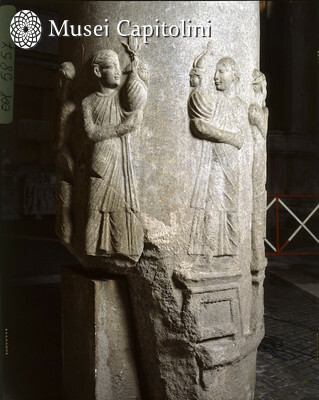 The column is part of a series of three similar exemplars found at different times in the area of the Sanctuary of Isis and Serapis in Campus Martius; a fourth column is now in the Archaeological Museum in Florence. It is certain that the Capitoline columns belonged to the temple of Isis in Campus Martius, even if it is difficult to imagine their location within the sanctuary. The dating is also uncertain, varying from the Domitianic period (81-96 AD), when the complex in Campus Martius was completely refurbished, to the Severan period, when there was an additional restoration of the architectonic complex. In recent studies the columns have been dated to the Severan period (193-235 AD), on the basis of epigraphic inscriptions and fragments of architectonic decoration of this period ascribable to the sanctuary.